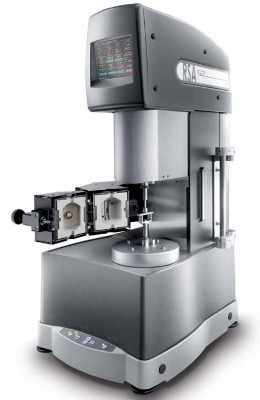 The new RSA-G2 from TA Instruments is the most advanced platform for mechanical analysis of solids. The separate motor and transducer technology of the RSA-G2 ensures the purest mechanical data through independent control of deformation and measurement of stress. It is capable of performing the most accurate DMA measurements as well as many additional experiments including creep and recovery, stress relaxation, stress ramps, strain rate ramps, iso-strain, iso-force, fatigue, multiwave, arbitrary waveform, and dielectric thermal analysis. With such a broad range of solid analysis techniques, the RSA-G2 is uniquely positioned to address the widest range of applications from the R&D bench to the quality control lab. This new high-performance instrument represents the fourth generation of dual-head mechanical analyzers, featuring a new forced convection oven for precise and accurate temperature control, extensive array of clamping systems to accommodate the widest range of sample shapes and stiffness, and immersion testing capability. In addition, the RSA-G2 doubles as a DETA, or Dielectric Thermal Analyzer, for stand-alone or simultaneous measurements.